David Pollock featured on The Kathleen Dunn Show! David Pollock, one of the authors of Bob and Ray, Keener Than Most Persons, spoke with Kathleen Dunn of The Kathleen Dunn Show! The Kathleen Dunn Show is featured on Wisconsin Public Radio, and in this episode she pays tribute to the late Bob Elliott, one half of the comedic duo, Bob and Ray. David Pollock also speaks about his book and the work that Bob Elliott accomplished. Hear more in the link below! We are saddened to hear that comedian Bob Elliott passed away on February 2nd. His most notable work, as one half of the comedic duo “Bob and Ray”, will always be remembered and we offer our condolences to his family and friends. In memory of Bob Elliott, below is an interview from 2013 where he and David Pollack, author of Bob and Ray, Keener Than Most Persons spoke with radio legend Joe Franklin. Today is Bob Elliot’s 91st Birthday! Along with his partner, Ray Goulding, Bob was an huge game-changer in the entertainment industry. His humor and personality has impacted TV and radio broadcasting (as well as the big screen and Broadway itself) to a legendary degree. Thanks for entertaining us all, Bob! Enjoy an excerpt from Bob and Ray:Keener Than Most Persons by David Pollock, as posted by HumorOutcasts.com. He reached over to the shelf in his cramped dressing room and, with a little tap, launched the handcrafted wooden Italian clown into another round of perpetual somersaults. The mesmerizing, brightly colored figure, a gift from his wife, Lee, had done all that Bob Elliott could ask of it to keep him nicely distracted from the anxiety-filled realities of that sweltering, September 24, 1970, opening night of Bob and Ray—The Two and Only. The large, brightly lit make-up mirror he seated himself in front of symbolized the alien world in which he now found himself. Elliott had been informed by the conventions and rhythms of broadcasting—radio guys did not slap on make-up and become Broadway actors; they performed comedy bits mocking Broadway actors, a responsibility he never shirked. Could tonight, he wondered, be some kind of cruel payback? 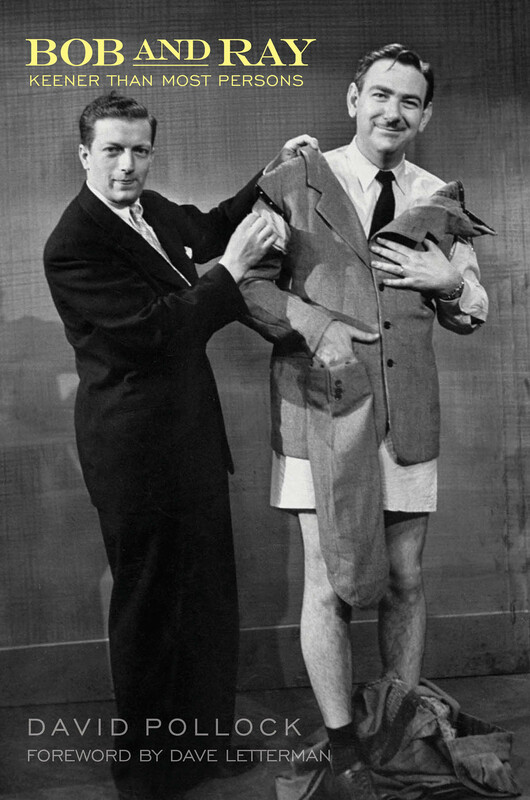 In AM radio’s twilight decades, Bob Elliott and Ray Goulding were snapped up by every major network still standing, some stretches on the air seven days a week. Their comedy, said Groucho Marx, reminded him of Robert Benchley: “They have that same Alice in Wonderland philosophy. . . . I’m just crazy about them.” Johnny Carson called them “two of the funniest—and most influential—humorists of their time.” But that was history now, as was their original nightly fifteen-minute NBC television series. Only some of the Broadway first-nighters in the John Golden Theatre would remember that Elliott and Goulding had been TV pioneers, on NBC five nights a week. Next door, in equally Spartan quarters, separated only by a common bathroom, sat Ray Goulding, mindful of his voice—all of his voices, in fact. As there were no understudies, if he had a cold, all of his characters had a cold. “It becomes an epidemic,” he liked to say. And he was in a constant state of worry that he might catch one. According to his widow, Liz, “He lived on Vitamin C.” For Goulding, it would take more than a somersaulting toy clown to allay anxiety. To keep reading, please visit HumorOutcasts.com. Onstage and Backstage podcast from Hal Leonard is available on iTunes and Libsyn. Each episode authors and their guests have a chat about the topics of their books. Bob Elliott of the famous Bob and Ray joins his biographer David Pollock to tell stories from David’s new book, Bob and Ray, Keener Than Most Persons. Get ready for some amusing “backstayge” anecdotes from one of the funniest broadcasters in radio history.